As far as the recipe goes, it is a pretty straightforward bread recipe. Mix, knead, rise, shape, proof, bake. I didn't do anything special to the technique for making it jalapeno-cheddar. I just tossed the pepper and cheese with a little flour and threw it in the mixer with everything else. I'm not sure if that's the "right" way to incorporate mix-ins into bread, but it worked this time! Joey really loved this bread. So much in fact, that he said I should start making it every week. It made the best BLT's ever, and is really tasty for breakfast with a little butter and honey. I don't know that I'll make it every week (I have so many recipes waiting to be made! ), but it will definitely make frequent appearances. Adjust one oven rack to the lowest position, and another to the middle position. Heat the oven to 200 degrees. When it is preheated, maintain the tempeature for 10 minutes, then turn off the oven. Toss the jalapeno and cheddar with 1 Tablespoon of flour in a small bowl. Mix 3 1/2 cups of the flour andthe salt in the bowl of a stand mixer fitted with a dough hook. Add the buttermilk/water mixture, butter, honey, and yeast to a liquid measuring cup. Turn the mixer on low, and add the liquid in a slow stream, increasing the speed of the mixer as you go to medium. Continue mixing until the dough is smooth and satiny, stopping to scrape the dough from the hook as needed. After about 2-3 minutes add the jalapeno-cheese mixture, and continue to knead about 10 minutes total, adding flour 1 Tablespoon at a time, as necessary to keep the dough from sticking to the sides of the bowl. Place the dough seam-side down in a greased 9x5 inch loaf pan, and press it gently to make sure it touches all four sides of the pan. Cover with a clean kitchen towel and allow to rise in a warm spot until the dough almost doubles in size, 20-30 minutes. Is there such a thing as having too many bread recipes? Especially ones that are spicy and stuffed with cheese? I think not. This looks great! Joanne, you are so right! 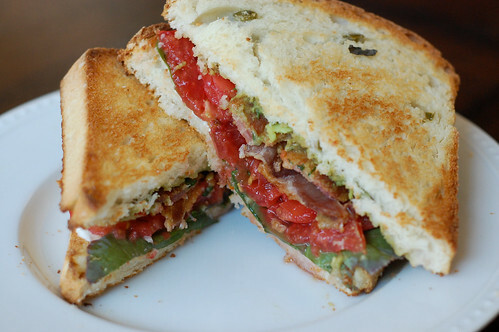 BLT on jalapeno cheddar bread?! umm can you send me one?! perfect use of the bread! i bet its really good for a breakfast sandwich with a fried egg, ham & Cheese too! You had me with the BLT on the Jalapeno bread, that sounds beyond delicious! This bread sounds so good and flavorful. There would be so many sandwiches that would be wonderful on it! Amy, absolutely! The only way to master yeast is to practice, so go for it! Looks great! We would like this in our house. This looks so delicious.......what an over the top sandwich this would make. I know we'd love it. I'm so glad I saw this on Foodgawker! Wow, I think I need that BLT....yep, Right.Now. This looks like an amazing sandwich bread! Yum! Ohhh delicious! 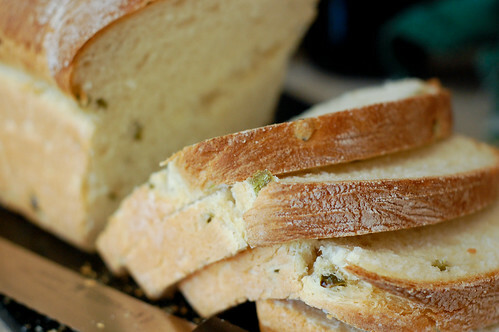 I've made quick breads with jalapeno and cheese but never sandwich bread. This looks awesome! I just finished one of the best BLTs EVER thanks to this bread. Yum! It was totally worth every, single, calorie. 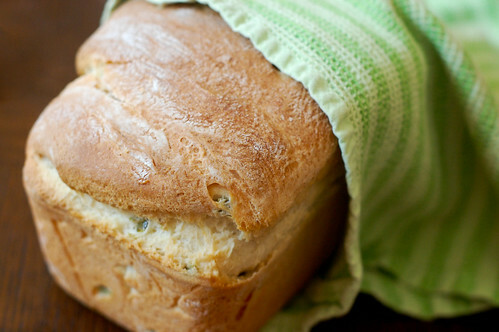 I just made this...and oh my goodness, it is the BEST bread I have ever had. My parents both agree too. It is so good just plain with nothing on it, and I can't wait to make a turkey sandwich on it for dinner tonight. I "accidentally" grated an extra 1/2 of the sharp cheddar and put that in. I am going to make 2 more loaves of this tomorrow to give to people! Thanks for this recipe!! I made this bread yesterday and it turned out very well! It turned out to be a really pretty loaf once it was baked and it was very easy to make using my Kitchen Aid :) This bread is super tasty plain and now I'm about to use it for my turkey sandwich! Good recipe. I will definitely be making it again. I just found your site last week. I found this recipe and just had to try it. This is the first time I have made sandwich bread. OMG!!! This is the best bread, I had it today with BBQ (husband smoked a pork shoulder yesterday) I can't wait until next summer for a home grown tomato so I can make a BLT with this fantastic bread!!! Thanks so much for the recipe and great directions!!! It was wonderful!!!!! Just found your blog and this is the first thing I have made. This bread is DELICIOUS! BLTs and black bean soup for dinner tonight. Now onto your chorizo recipes..... hmmmm! I just found your blog and made this yesterday. Mine came out very dense but DELICIOUS!! Amazing. Think I needed to have let it rise more for a less dense bread? can this be made in a 2 pound bread machine maker? I'm not familiar with bread machines, but I'm sure it could be adapted to work in one. You are the first blogger to ever answer a question I asked, so thank you.